Spring style can be tricky because of the unpredictable weather. This week’s outfits are perfect for spring weather with on trend cuts and color pallets. I have fallen madly in love with the embroidery trend … and the bell sleeve trend for that matter. This shirt is so pretty, and it’s so perfect for spring. 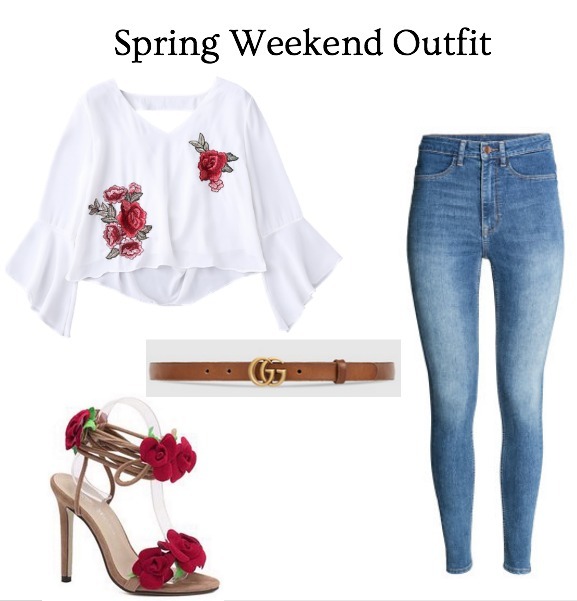 Paired with high waisted denim and the “it” accessory for spring (this Gucci belt is so popular and goes with everything) and you’ve got an on-trend spring outfit. I also fell in love with these rose bud heels the moment I saw them! These would go with so many casual spring outfits- from chambray dresses, to rompers. These are definitely worth a buy! Spring at work is tough because you want to move away from black and navy, but you still need to wear professional colors. Grey and blush is therefore my favorite work day color combination for spring and summer. This grey sweater is cashmere and is SUCH a good deal right now. I love adding sweaters to my closet in the spring because a) they’re so much cheaper and b) you will still wear them in spring – especially if you work in an office (since they seem to be cold no matter what). I also love tie waist pants for spring (you may remember my rust colored pants). I definitely want to add these blush pink ones to my wardrobe! "My Mom: The Original “And” Woman"
"Lipsense Review (from a Non-Distributor)"